Stefan and I attended Devopsdays last week in Austin. It was a great event, and I am really glad we went -- it’s always fun to be able to present your company to the public. We are very comfortable with the development and operations crowd, because it is largely at the core of what we are doing ourselves. There’s not a whole lot of abstractions to overcome! 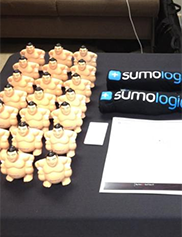 Sumo Logic sponsored the event, and so we had a little table set up in the “vendor” area. There, as well as throughout the conference, we had many interesting discussions, about our product, but also about the larger theme of the conference. We gave away a lot of T-Shirts, and it turns out that the little Sumo toys we had initially made for the company birthday two weeks ago are a great giveaway. This is the first time we came equipped with swag, and it came across well. As topical as Log Analytics and Application Management are for the crowd attending, it’s still fun to see them all smile at little toys of big naked men! Maybe my single most favorite moment of the entire conference was when the discussion turned to hiring. We are still struggling with a recovering economy and uncomfortably high unemployment numbers in this country, so it was notable that when the room was asked who’s hiring, pretty much all hands went up. Wow. Then somebody yelled out, “Hey, who needs a job”? And all hands went down. Not a single person in the room was looking for a job. In the words of @wickett on Twitter: “No recession in DevOps world”. I was trying to listen in a bit more closely this time. A good overall summary of where Devops has come from -- and what its main motivational forces are today -- is available in a recent post by John Willis. John also presented the keynote kicking off the Austin event. This was a very interesting talk, as it was laying out the basic principles behind Devops as seen through the eyes of one of the main players in the movement. Based on the keynote, here’s Devops in 5 keywords (buzzwords? ): Culture - Lean - Automation - Measurement - Sharing. In that order. This leads to the following insight: Devops is a human problem -- it’s a problem of culture, and it’s the cultural aspects that need to be addressed first, before even thinking about the other four principles. In other words, as great as tools such as Puppet, Chef, Github, and yes, Sumo Logic are, they can’t in themselves change a culture that is based on segregation. Or, simply put: as long as you have (process and cultural) walls between development and operations, operations and security, and security and development, you end up with people that say No. And that’s basically the end of agility. And this leads to something that surprised me (I guess I am a bit late to the party, but hey): I am sensing that Devops is really about the desire on the side of the operations folks to apply the learnings of Agile Development. I consider this as a good thing. We are building more and more software that runs as a service, and so it’s pretty obvious that Agile needs to extend from the construction process into the deployment process (and along the way destroy the distinction). I do think that the Agile approach has won in the development world. It still needs to be applied properly however (see for example “Flaccid Scrum”), and I am sure overeager managers will cause more than one spectacular failure for Devops projects by misunderstanding the process/tools vs culture priorities. And since we are in 2012, Agile rears its head in one of its newer incarnations in this context: Lean - see above, right after Culture. Given that the name “Devops” is still hotly discussed, maybe we will end up with a new label before too long: LeanOps, anyone? It was also great to see teams within larger companies making the leap - the best example is National Instruments (also the host of the event), who have managed to get more agile by adopting a Devops approach (see also this presentation). So in summary, this event was great fun. A lot of real people with real problems, applying real forward thinking. I felt the crowd was leaning more towards Ops vs Dev, but as I said above, at least in the context of the systems we are building here at Sumo Logic, this distinction has long been jettisoned. And of course, people need tools. In all our discussions, the ability to manage and analyze the logs of production systems has stood out as a key contributor in allowing teams to troubleshoot and find the root causes of issues in the applications faster, and to manage their applications and infrastructure more proactively such that they can find and fix problems before they impact the customer. Finally, in an act of shameless self promotion, here’s yours truly being interviewed by Barton George from Dell during the event.